Posted on March 26, 2012 March 27, 2012 by Curt O. On March 12, 2012 suspected Japanese tsunami debris was discovered washed up on the beaches of Long Beach, CA. 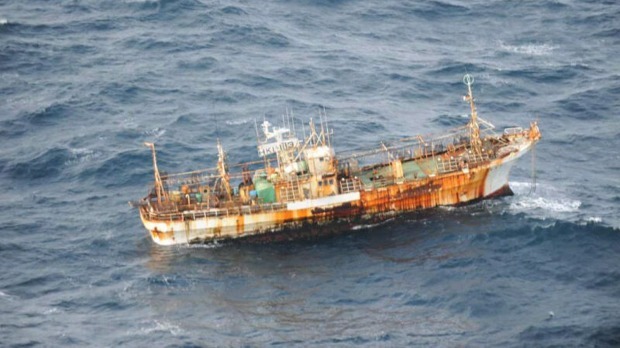 On March 11 a deserted fishing vessel was spotted off the coast of British Columbia; by March 24 it had drifted within 120 miles of the coastline. 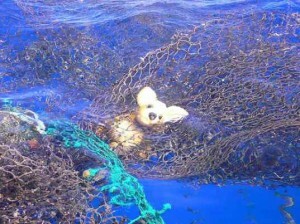 For many years NOAA.gov has been monitoring an every growing area in the North Pacific dubbed the “Great Pacific Garbage Patch” that appears to be collecting and concentrating all manner of plastic debris from all over the world. Whether you are a dedicated environmentalist, or a person that leans more towards managing and sustaining the Earth’s valuable resources indefinitely, or are simply annoyed at having to photoshop garbage out of your pristine vacation pictures; the rapidly increasing amounts of trapped ocean debris should be a concern for everyone. How does any of this relate to the FlightGear simulator? Please read on! Computer vision is a broad field that involves processing real world images or video to try to automatically extract data or intelligence. 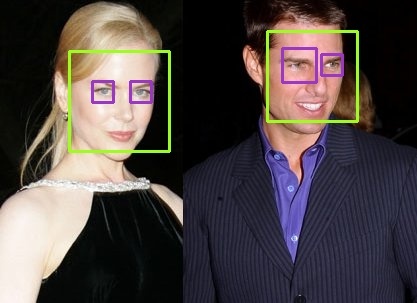 Applications range from identifying items or features of interest (such as facial recognition) to extracting geometry and physically locating or reconstructing the layout of a scene to manipulating images in clever or useful ways. In many ways computer vision is a fascinating and magical area. We all have seen software programs that can identify every picture of our Aunt Tina on our computer after we’ve identified her face in one or two pictures. There are computer vision systems that can track people or objects that move through a network of many camera views; computer vision systems can estimate your head orientation and even figure out what direction you are looking or what object you are looking at.. Computer vision software can recognize cars, read printed text, and scan for subtle features hidden in images — and because these programs are automated, they can run around the clock and process vast amounts of imagery. They never get fatigued, they never get bored, and they never start day dreaming about their weekend plans. Writing an application to do computer vision is similar to writing any other application. The basic cycle of edit, compile, test, repeat exists like with any other program. Computer vision algorithms apply logical rules and procedures to the image data in consistent ways to accomplish their tasks. There really isn’t any magic, even though the results do seem magical when they outperform the abilities or pace of a human. However, it can be a challenge to develop some computer vision applications if you do not have good access to the kind of imagery you plan to ultimately be processing. As you can imagine, computer vision applications must deal with huge volumes of data. Often they process live video data from multiple cameras and that data may need to be associated with other data sources in real time — something that may not be possible to test in a lab with prerecorded video. Imagine you are developing an application which will process aerial imagery to extract some data (i.e. facial recognition) or locate and track items of interest (i.e. 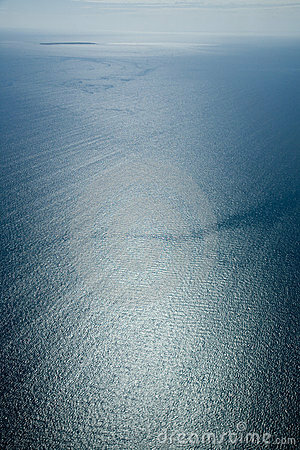 a big chunk of debris in the ocean.) It could very likely be the case that you do not have much sample video to test with. 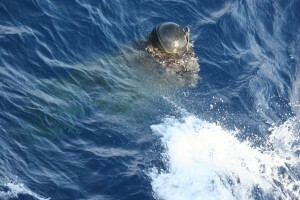 In the case of ocean debrid, it may be that you do have video from the correct altitude or taken at the correct air speed, or with the correct camera field of view or camera angle. However, computer programs are most efficiently developed in the lab with repeatable test data and not in the field with whatever random imagery the day offers — this can lead to a disconnect between what imagery is needed for effective testing and what imagery is available. For several years I have been involved with a company that develops UAV’s and remote sensing and tracking systems for marine survey and research use. One of our primary partners is NOAA.gov. 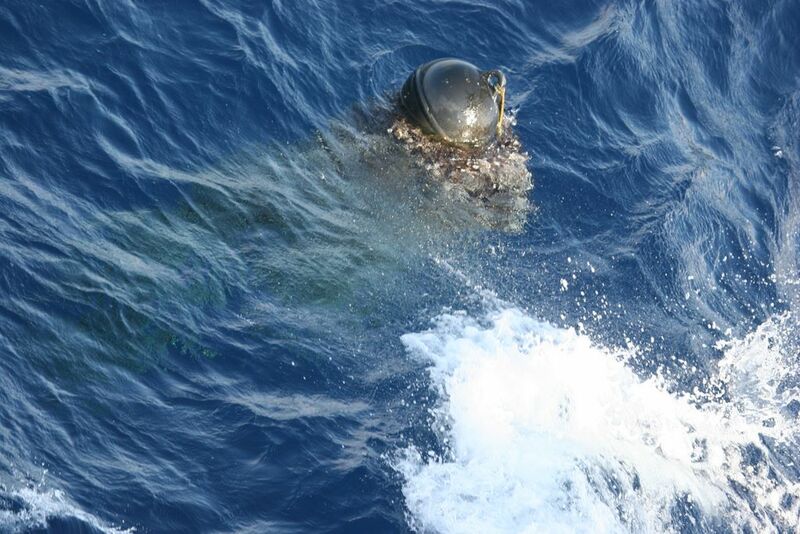 NOAA has a keen interest in understanding, tracking, and ultimately cleaning up debris in the ocean. With the Japanese Tsunami last year, the issue of debris accumulating in our oceans has become even more important and critical, yet there is no effective strategy available for locating and removing debris from the ocean. A satellite can survey huge areas, but not at the detail to identify specific pieces of debris. A manned aircraft can fly at several hundred kts and cover a wide area at a low enough altitude to spot individual pieces of debris, but there is nothing you can do when debris is located. A ship travels very slowly and has a very narrow range of view for onboard spotters. 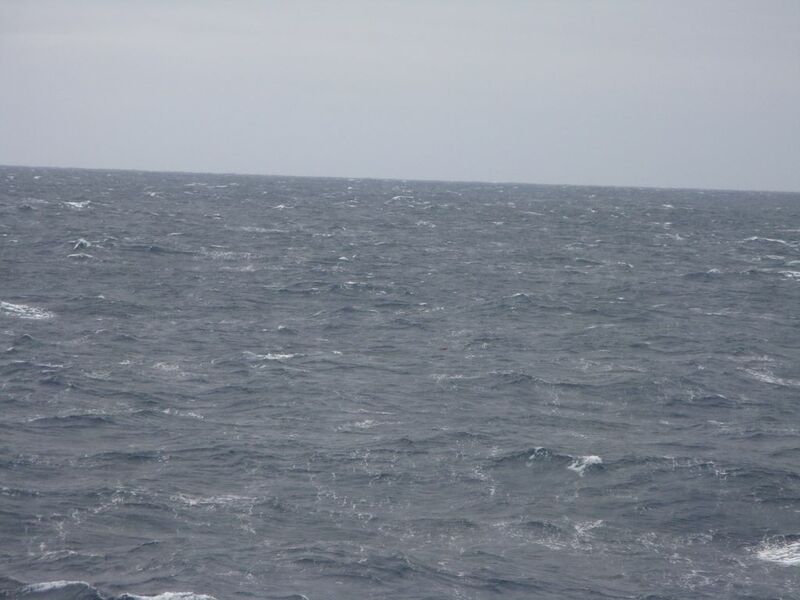 A ship might do 10 kts (give or take) and with binoculars a human might be able to spot debris one or two miles away — if they are looking in the right direction at the exact moment a swell lifts the debris up into view in front of the nearer swells. 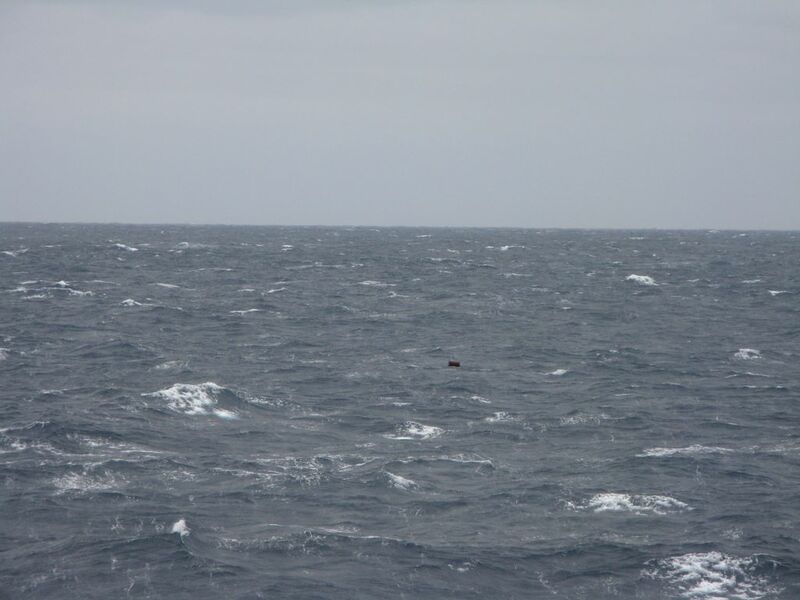 The upper decks of a ship offer some height for observing debris, but swells hide objects more than they reveal them. You have to be looking in the right direction at the right time to even have a chance to spot something. In addition to all the other challenges of ship-board debris spotting, the rolling/pitching motion of the ship makes the use of binoculars very difficult and very fatiguing. 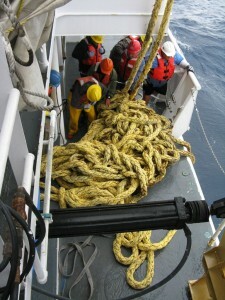 A UAS offers numerous advantages over a human operator searching from the highest deck of a ship. 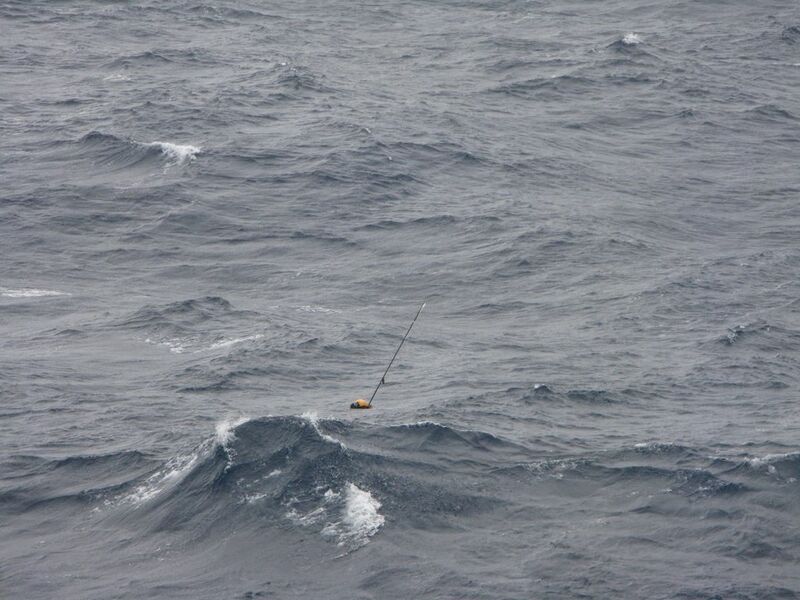 The UAS offers a much higher altitude perspective looking downward so that swells and waves can’t hide objects. The UAS offers faster speeds to visually cover more area in the same amount of time. The UAS can carry a variety of image sensors including IR cameras or multi-spectral cameras which offer increased ability to reliably detect certain types of objects under a variety of conditions. 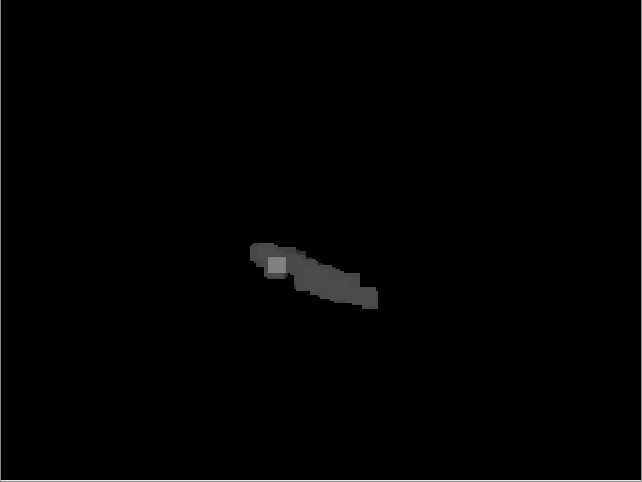 Add computer vision software to process the UAV’s imagery and an effective debris location and tracking system begins to emerge. The UAS has limited range though; and if a significant object is detected, it has no ability to tag or recover the object. 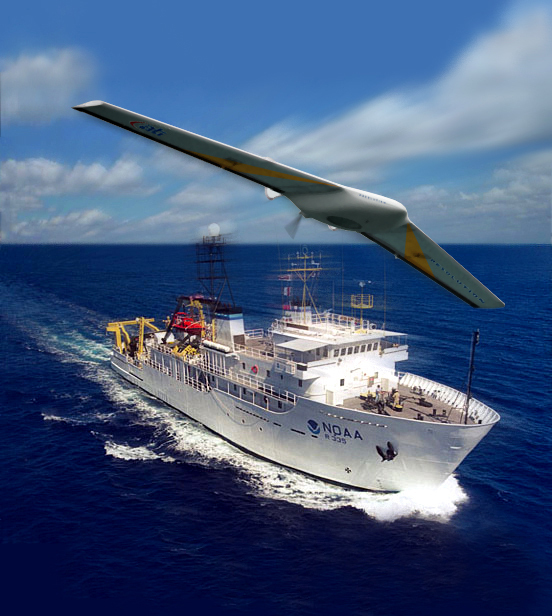 Thus it is important to combine UAV operations with a ship in the vicinity to support those UAV operations and be able to take action when something is found. As with any computer vision application, narrowing the scope and focus of the application as much as possible makes solving the problem easier. 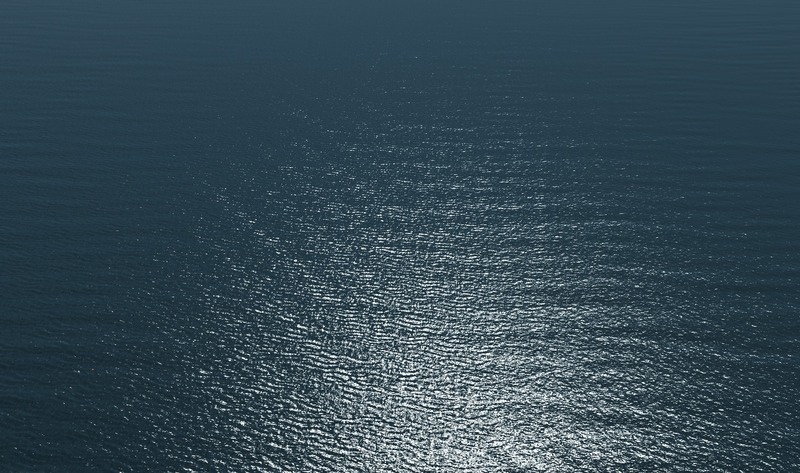 Using the example of a UAV flying over the ocean and collecting imagery from a camera looking straight down, then the camera frame will always be completely filled with a straight-down view of the ocean surface. We assume we don’t have to deal with the horizon, sky, or clouds or nearby coastline. The result is that the ocean for the most part is some shade of blue — that is convenient. Anything that is not blue is not ocean and then becomes highly interesting. But despite limiting the scope of the problem in this way, the computer vision application still has to deal with several significant challenges: 1. Sun glint — the sun reflecting back at us off the water. 2. Windy days in excess of 12-15 kts produces breaking waves, foam, and even streaking (lines of foam) on the water. 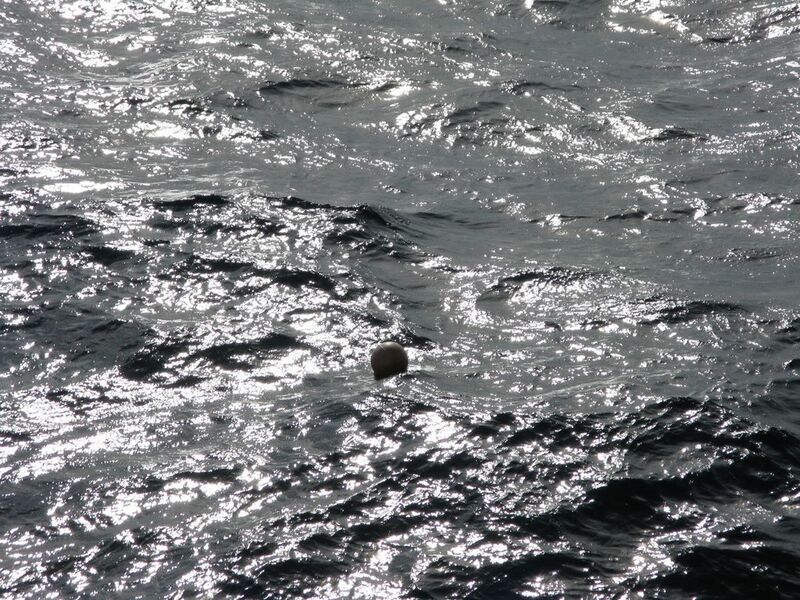 Visually, sun-glint and foam impair our ability to spot objects in the water. Why use FlightGear instead of real camera imagery? FlightGear generates realistic views of the earth and offers complete control over the altitude, speed, camera orientation, and field of view of a simulated flight. In addition, FlightGear can provide flight telemetry data and other data that is useful for testing or simulating real world environments. We can also control the time of day, clouds, wind, precipitation and fly missions anywhere we like. With FlightGear’s scripting engine, it’s possible to stage static or dynamic scenarios to create the sort of test cases we expect to be able to ultimately handle. Of course only a small slice of computer vision applications relate to processing aerial imagery, but as UAV’s begin to attract the attention of more and more civilian and private organizations, the need for automatically processing huge volumes of imagery data will only increase. As FlightGear continues to develop and evolve, the quality and realism of it’s graphics also are improving. In the most recent version we have taken significant strides forward in drawing realistic ocean scenes that include accurate coloring, accurate rendering of different sea states and types of waves, very realistic sun glint, realistic sea foam (the result of breaking waves on windy days), and even rolling wake and foam created by large ships. The quality of FlightGear ocean scenes can now (in many cases) make them almost indistinguishable from real camera imagery. OpenCV is a library of data structures and functions that offers most basic image processing tasks, as well as many of the more common advanced functions. 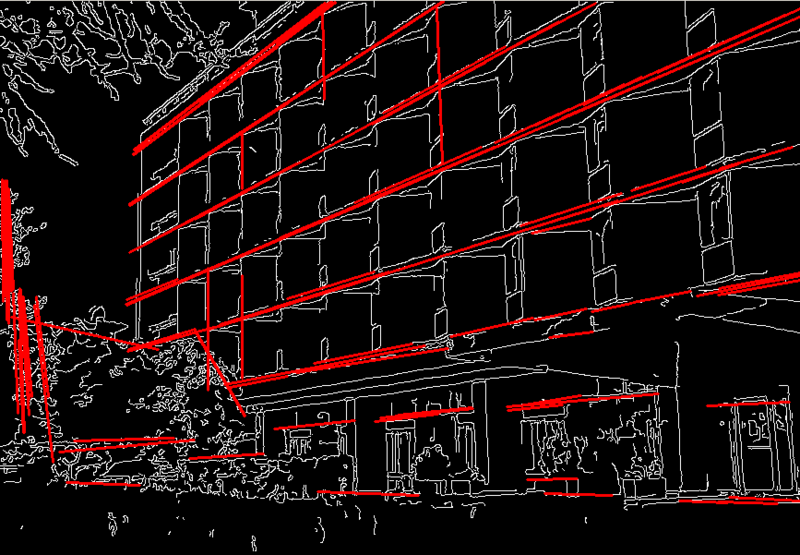 OpenCV provides the building blocks a developer needs in order to start writing a computer vision application. OpenCV runs on Linux, Windows, Mac, and even Android. How to connect an image processing application to FlightGear in “real time”. Disclaimer: the nuts and bolts that I explain in this section are focused on the Linux platform. These same tools are likely available on other platforms and may be leveraged in the same (or similar) ways to accomplish the same thing — but outside Linux your mileage may vary as they say. I know how to capture a portion of my desktop as a movie and save it to a file. My computer vision application knows how to read a movie file and process it frame by frame. What is missing is that I want to be able to do this in real time without having to fly and save the video and the process it later. My basic strategy is to first create a unix file system “fifo”, then write the captured video to this fifo, and simultaneously read from the other end of the fifo into my computer vision application. Start FlightGear at your simulated camera resolution. I have a cheap web cam that does basic vga (640×480) video, so using that as my “standard” I can run: “fgfs –geometry=640×480” to launch flightgear with the correct window size. Next I drag the FlightGear window into the upper left corner of my screen so it is in a known location. That’s all it takes and the computer vision application is up and processing live FlightGear generated imagery. One thing I discovered with fifo’s. : it seems to work best to start the reader (the CV app) before starting the writer (ffmpeg). This way the buffers don’t fill up and cause delays. The image partitioned into water vs. not-water. Lastly, here is a youtube video showing all the pieces working together. 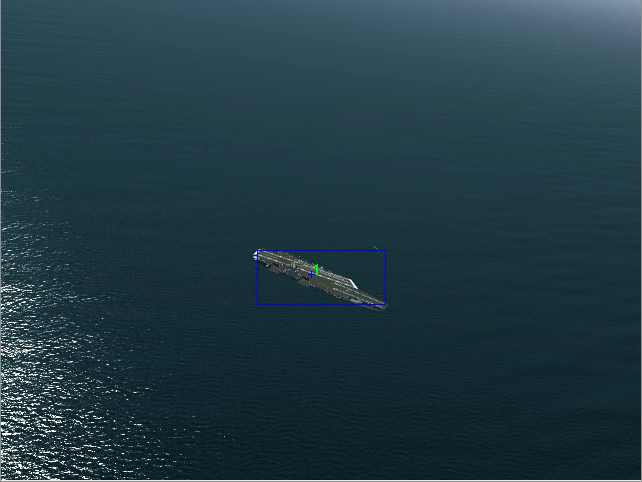 In FlightGear: I have created a random debris field scattered across an area of open ocean about 6nm x 6nm. I have added a downward looking camera to my test aircraft. 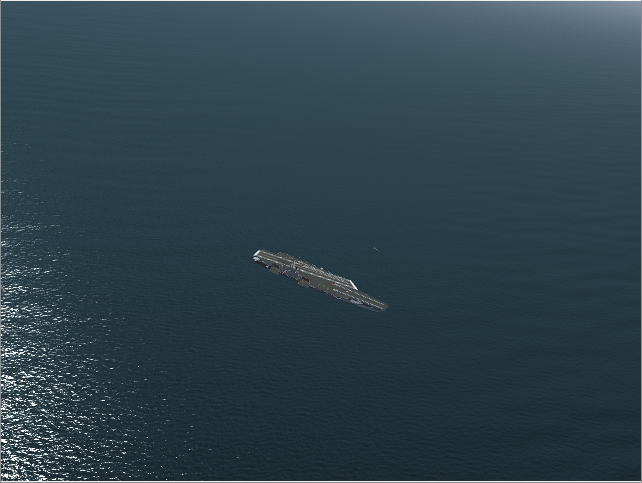 Then I built a route that flew several “transacts” (straight line paths) through the debris field. I used the above mentioned procedure to feed the live FlightGear imagery into my computer vision algorithm that detects and tracks anomalies. The debris you tend to see from the air looks very small — usually just a few pixels at best in your image, so the algorithm needs careful tuning to avoid false positives and missing objects. 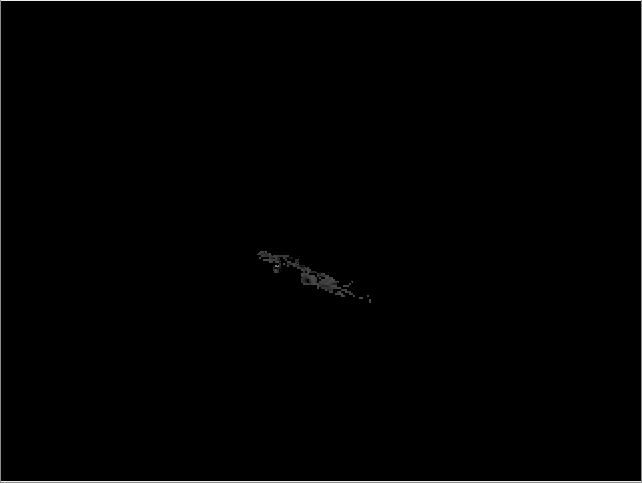 Please watch this video in full screen resolution so you can see the specks of debris and the tracking algorithm in action! hello Curt, interesting use of FlightGear here ! What type of computer vision algorithm have you been using? (source code?) Have you done further work on this since 2012? I would be happy to reheat the subject! Hi Tom, this particular source code is not available as open-source, but it also would be pretty underwhelming if you did see it. It was a fairly simplistic blob detector / tracker, with some dynamic threshold adjustment (to compensate for cameras that are doing their own dynamic white balance / brightness adjustments, and to compensate for changes of light looking different directions and things like that.) There was some additional work to try filter out sun glint and foam. That specific project wound down last spring so I haven’t done any more work with it. 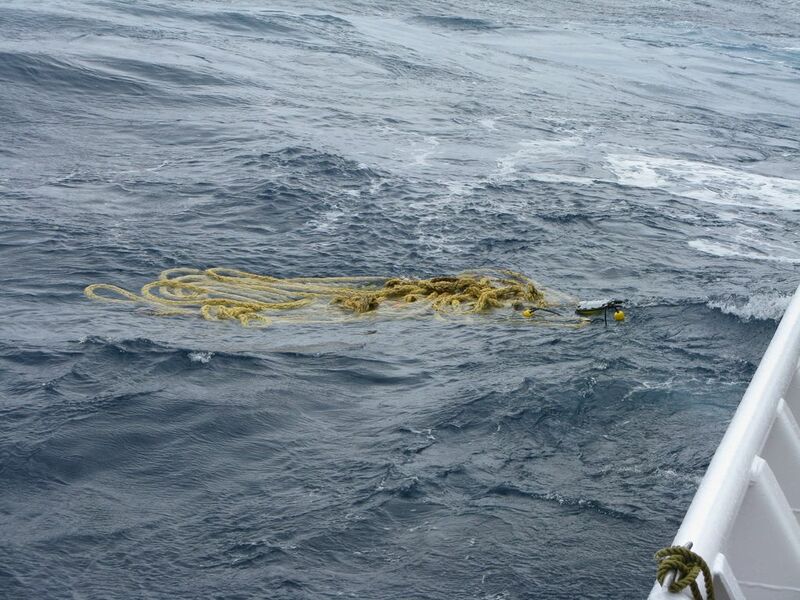 Hi Curt, do you know if anyone (NOAA or other organisations) has gone up to field test on this attempt to detect debris at sea? I have heard of some projects developing automatic marine mammals detection for counting population. Do you have videos of marine debris (Flight gear/real) so that I can try some similar detection algorithms? Sadly the video we collected ourselves came back completely screwed up. I have seen video from a Puma uav test flight, but the operators seemed to enjoy looking at sunglint most of the movie (and it’s not my data to share.) That was one of my own challenges, no good actual video data to develop with. FlightGear was good up to a point, but you got perfect pixels with perfect color differences, so the algorithm would always perform much better than I’d expect in the real world. It was a challenging problem and very difficult to make the computer do better than a human eye (especially if you are trying to avoid false positives.) There was some expectation originally that we’d be able to pick out debris that was one or two pixels, but the reality is dumb camera systems do all kinds of compression which leads to all kinds of artifacts, any video transmission system will have transmission artifacts (analog or digital.) You have to content with sun glint all over the place, and if the winds are more than 10-12 kts, you start picking up sea foam. Combined with no real data, it was difficult to really dial in and get a good result. We definitely bit off more than we could chew with that project, but it was a good thing because it really pushed us in many directions. In the final demonstration of the system, our flight was ended after 42 seconds due to a servo failure, so we went home with our tail between our legs, sadly. But I’m still working on vision algorithms in other areas and continue to develop autopilot technology. My latest effort is to deeply integrate python and fully open-source the core autopilot code. The end result is that ‘advanced’ users could develop their own onboard task logic in python that directly interacts in the main loop with all the other important variables and data in the on-board system. That’s a lot of rope to hand a user, but for people doing research or wanting to try new ideas, you need an open-system, and you need an open-system that isn’t so complicated that you can’t make your needed changes anyway. Could I get a little how-to for a Windows environment to do this? The technique I used to capture the FlightGear window in real time, convert it to streaming video, and then feed that into my computer vision algorithm uses named pipes. As far as I know this is not an operating system feature that Windows supports. There are probably other ways to do similar things in windows, but I did all this work under Linux. If you (or anyone else) is able to puzzle out a way to do this sort of thing under Windows, I’d be happy to post an update to this article with that additional information. Thanks! Nice application. I would suggest, if you want to get close to real time processing, to replace the fifo mechanism. I suspect mkfifo creates a virtual file in kernel space, so every write/read operation causes a delay (context change) as you go from user to kernel and back to user space. A shared memory block and some synchronization code should make you system several times faster. The only catch is that you must hack either FG or ffmpeg so that they write the image to the shared memory block. Thanks for the tip Paul — I know there are some relatively small multispectral cameras available — but not cheap! We are hoping to get some chances later this summer to go out and do some real debris hunting again. That kind of application could be useful. I’m just wondering how to retrieve images from Fifo with opencv. From your opencv app, just open the fifo like it’s any other movie file. I named the fifo something like /tmp/fifo.avi in case that would help opencv figure out the movie codec. Thank you. My problem was apparently last version of opencv can not open fifos. Which version of opencv do you use? I’m running OpenCV v2.2.0 on Fedora 15 (using stock Fedora packages.) In the past I’ve built opencv from source to support additional libraries, but that’s a pain and now I’m just trying to run on top of stock opencv packages as provided by my distro. Assuming you are running FlightGear 2.6.0, then you may need to turn up your shader effect levels in the Rendering Options dialog box. The ffmpeg call looks really simple and useful. How fast and with what latency is ffmpeg able to record the desktop in this manner? I’ve managed to capture 30 fps video at 720p resolution (1280×720) of FlightGear also running at 30fps — all on my desktop. For the vision processing, I’ve been able to sustain 15fps in “near” real time. There is a frame or two latency in video processing if you put the opencv output next to the original FlightGear, but if you consider the pipeline that all the information has to go through, I think it’s pretty reasonable. Assuming FlightGear uses the same spec for the -geometry switch as other applications, you can give the desired window position on the command line. No need to drag. So, -geometry 640×480+0+0 will do the trick. Really awesome! ..but where’s the video?